This article is about the Jewelry Crafting material. For the person, see Silver (person). 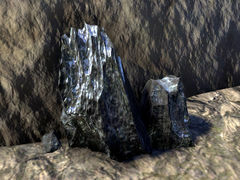 Silver seams can be found near cliffs and mountains at Engraver level 3 or at character level 1-79. They can be harvested for three to four samples of the raw material, Silver Dust. Once ten samples of dust are collected, they can be refined into seven to ten Silver Ounces. Silver Jewelry is crafted from the refined silver ounces at any of the jewelry crafting stations.